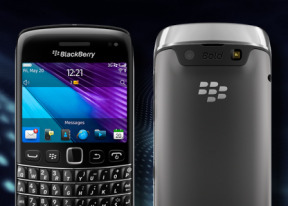 The BlackBerry Bold 9790 comes with the standard set of accessories. The compact retail box fits a charger, a headset and a microUSB cable. No microSD card is provided. There's no leather case either - a nice accessory that the Bold 9780 could afford more than a year ago. The BlackBerry Bold 9790 is tangibly smaller than the Bold 9900 and that's more than welcome. Yes, users will have to make do with a smaller screen and keyboard, but it's not a thing to ruin the usability. OK, maybe you won’t get the same level of comfort as with the 9900, but the Bold 9790 is the compact class. It weighs 107g and stands at 110 x 60 x 11.4 mm. The important thing is the touchscreen / QWERTY combo works fine and the phone looks nice and feels solid. The BlackBerry Bold 9790 has the same layout of controls and keyboard design as its bigger 9900 sibling. The handset is comfortable to hold and the finish is very pleasant. The Bold 9790 does just fine without the metal accents and fiberglass of the flagship. To begin with, there're no glossy bits anywhere on the phone's body except - inevitably - the screen glass which transitions into a huge Lock button at the top. The chrome frame does come across as a bit cheap but the rest is simple and practical. We especially liked the rubbery finish of the rear. In terms of layout, it's the traditional messenger design. The front is almost equally split between the 2.45" touchscreen and the keys. The difference to the Bold 9900 is that this time around all four controls around the trackpad are stand-alone instead of sharing a single piece of plastic. This is probably not as elegant but individual keys are a lot more tactile and solid to press. The 2.45" touchscreen has HVGA resolution, down from VGA in the premium Bold 9900. Effectively, it's a pixel density of a little less than 250ppi. The images are reasonably crisp, and the screen looks vibrant and punchy. The sunlight legibility is as good as on the Bold 9900 and we don’t mind the viewing angles either. Here is how the BlackBerry Bold 9790 stacks up against similar devices in our traditional screen brightness test. Above the display we find the earpiece, along with a status LED. Right next to it hide proximity and ambient light sensors. The QWERTY keyboard of the 9790 has the traditional Bold style of sculpted keys, with metal ridges separating rows, exactly like in the Bold 9900. You can enjoy great tactility even though the keyboard is crammed in a little less space. Many of the keys (not just the numbers) can be assigned speed dial. There is a dedicated currency symbol key and the usual command shortcuts: * locks the keypad and screen while # toggles Silent mode on/off. Numbers share keys with some of the letters and you need to press the alt key to use them at times. The good thing is that whenever the context allows it, the switch is automatic. The mouthpiece is just below the keyboard. The usual set of BlackBerry controls are between the keyboard and the screen, either side of the trademark touchpad. The Call, Menu and Back keys are separate buttons with rounded edges and excellent press. The left side of the handset features the 3.5mm audio jack. It's exactly the same layout as in the Bold 9900, though an audio jack usually makes more sense at the top or bottom. The right side of the BlackBerry Bold 9790 brings no surprises - there we find the volume controls and the single convenience key set by default to start the camera and serve as a shutter key. An important difference for those coming from the Bold 9780, is that the shutter key is not a two-step button. With the auto-focus camera being a key feature of the Bold 9790 - something for it to wave in the face of the flagship - it's a shame RIM didn’t bother put a proper shutter key. They must've thought the traditional continuous auto-focus is enough. There is a very small pause/mute button between the volume Up and Down keys. The volume rocker and the camera key are slim pips of black rubber - a bit tricky to press but very easy to locate by touch. The top of the Bold 9790 as we already mentioned is an extension of the glass covering the screen. There you'll find the single Lock key. This is the familiar invisible key design but it didn't quite work as planned this time around. The Lock key is really hard to press to a point where it becomes a real nuisance. The bottom features the microUSB port. A 5 megapixel auto-focus camera lens and a LED flash are the most notable features at the back. They are placed on a black plate made of matte plastic. The loudspeaker grille is squeezed between the said plate and the chrome frame. The battery cover is all plastic, with a soft, rubbery feel to it, which is practically immune to fingerprints. It is easily opened with a slide. The price for this comfort is imperfect fit, resulting in a minor but irritating wobble. The 1230 mAh Li-Po battery is quoted at up to 408 hours of stand-by or 5 hours and 20 minutes of talk time. 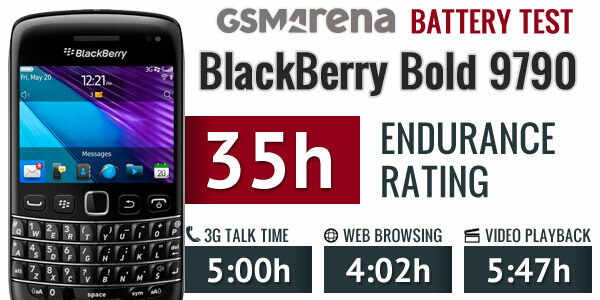 In our battery test the Bold 9790 achieved a score of the average rate of 35 hours in our battery test. This means that if you use your device for an hour each of phone calls, web browsing, and video playback every day, you will have to recharge it every 35 hours. The microSD slot is under the battery cover, but is still hot-swappable. There is a small flap made of blue rubber, which you need to lift to access the card slot. It keeps the memory card in place after that. The BlackBerry Bold 9790 is the usual solid job, although you're not supposed to get a fancy design and unique finish. It feels solid in the hand, with great grip and good ergonomics. It's the compact class of the premium Bold line and it seems to hit the right balance. The smaller, friendlier size of the Bold 9790 makes a lot of sense as an alternative to the flagship.